Honestly, the "Little Brother" tag led me to believe that B Hotel was a small businesss inn, tucked away in a corner of Madrigal Park. Upon driving up Prime St., I realized that this was no Boutique Hotel. B Hotel is the real deal. 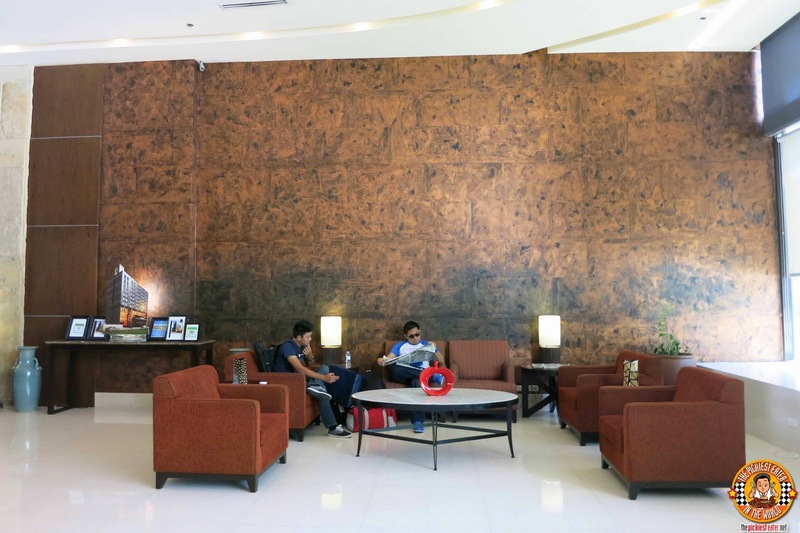 If Bellevue is best known as an ideal choice for families to stay at in Alabang, B Hotel takes pride in catering to the needs of the travelling businessman. 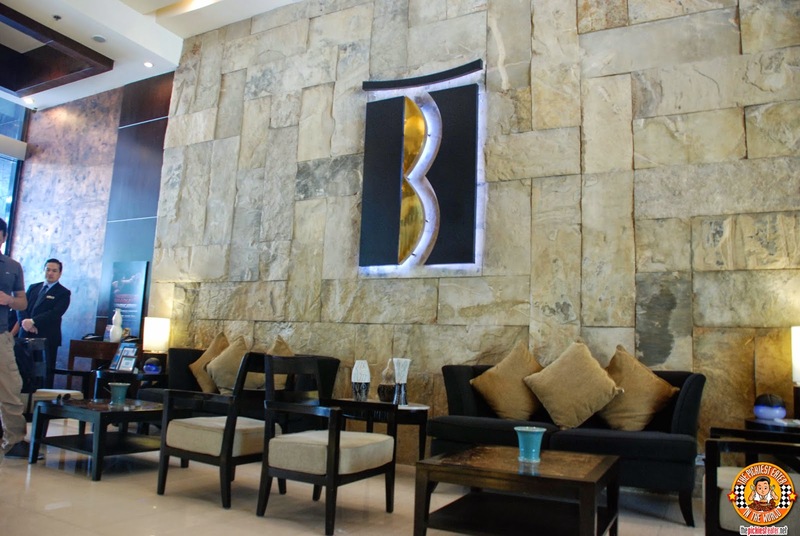 At B, you get the comforts of a luxury hotel (albeit a bit smaller) but at a more budget friendly rate. I was looking forward to staying here over the weekend, but unfortunately the entire hotel was fully booked! Thankfully, one Penthouse Suite was available for viewing, so we went up for a quick look. 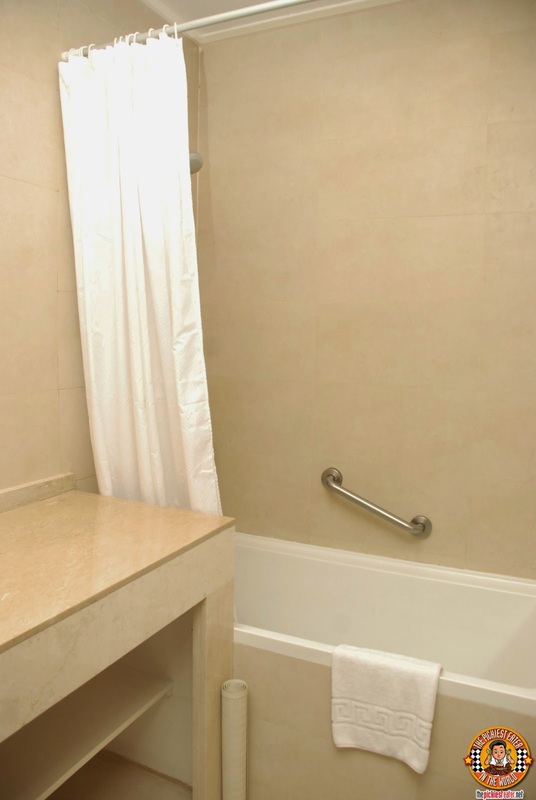 The moment I stepped out of the elevator and on to the floor of the Penthouse suites, it was very clear that B Hotel wanted to make sure that every second a guest spends with them, is that of comfort and relaxation - Something extremely essential to the traveling businessman on a hectic schedule. 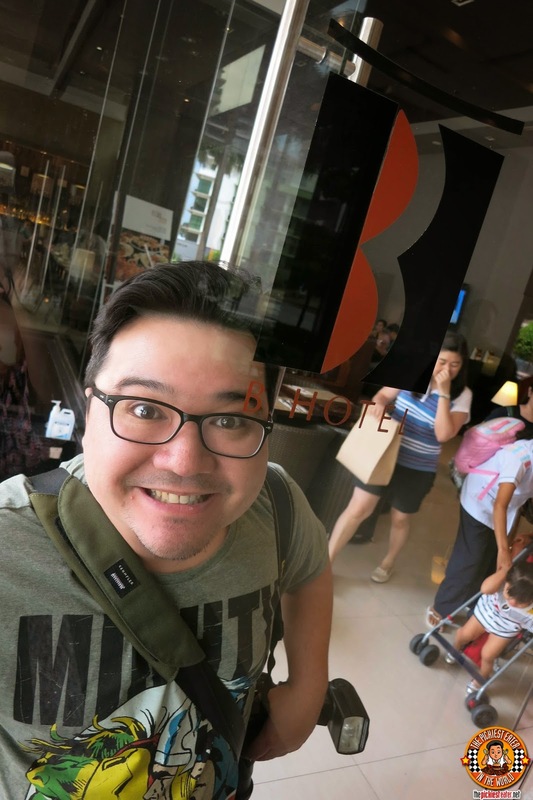 When they get back to their hotel from a pressured filled day of meetings and the like, they are looking for a reprieve from the stressful rat race..
And B Hotel is exactly that. 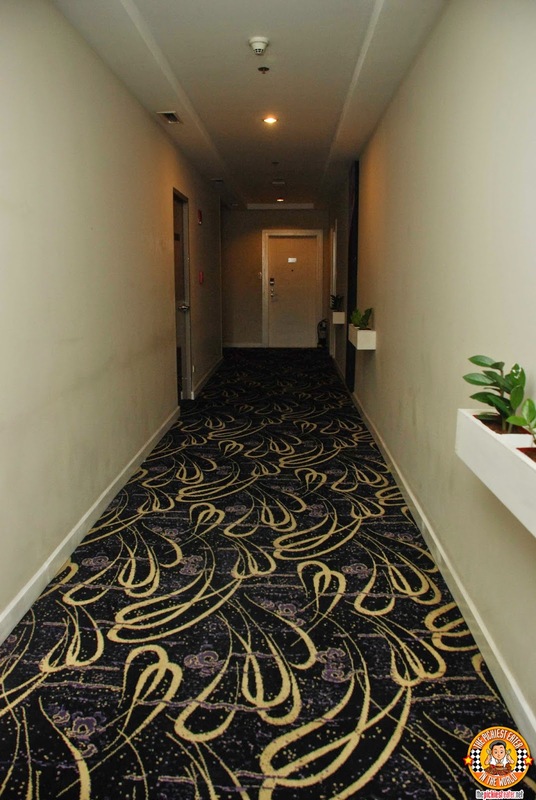 Walking down the carpeted halls of the penthouse floor, was a reaffirmation of the soothing tranquility that I imagine a businessman would seek. With a layout similar to a one bedroom condominium unit, B Hotel's penthouse suite makes you feel right at home. 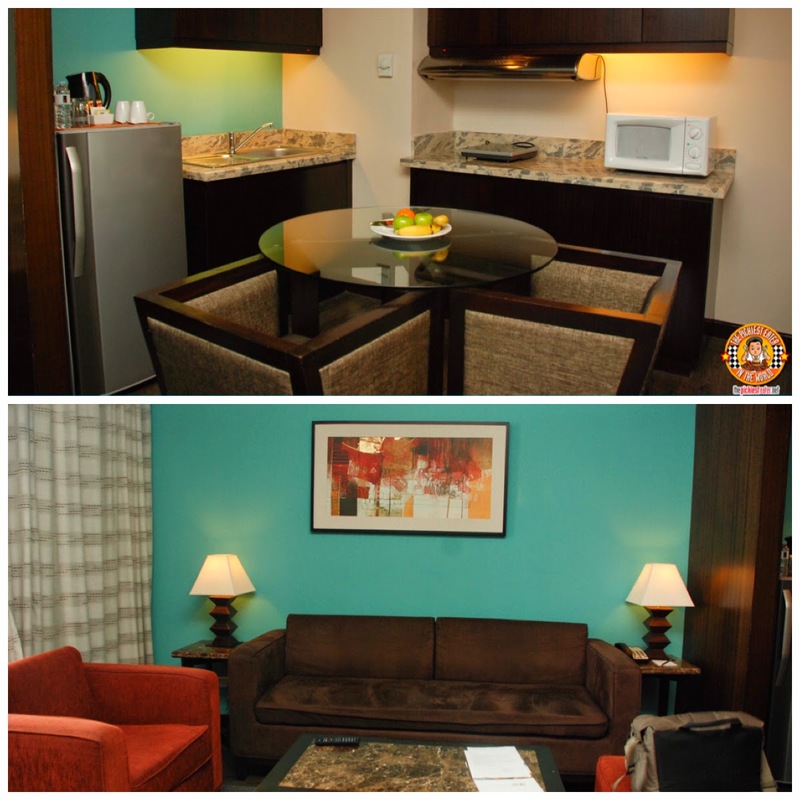 The Penthouse Suite is furnished with a microwave, refrigerator, and even an induction burner. The room also includes a balcony in both the living room and bedroom, but unfortunately, the doors are locked, as a security precaution. The bedroom is rather spacious and homey, and gives you a stunning view of the thriving Madrigal Business Park. The room is also equpped with a flat screen TV, when compounded with the Fluffy Queen sized bed, It would make a very comfortable place to recharge your energy, the night before another high paced day. 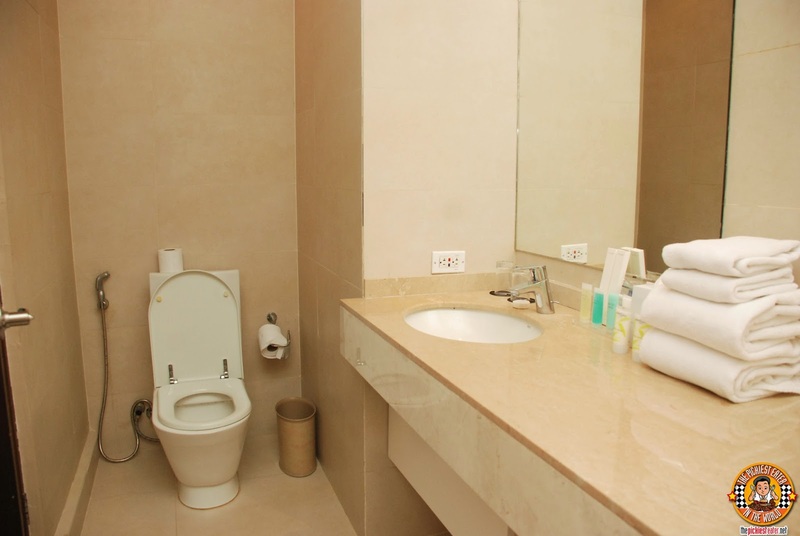 The Bathroom is set up with a bathtub and shower, and the Toilet area is more than adequate to handle your more .. umm.. "Personal" business dealings hehe. 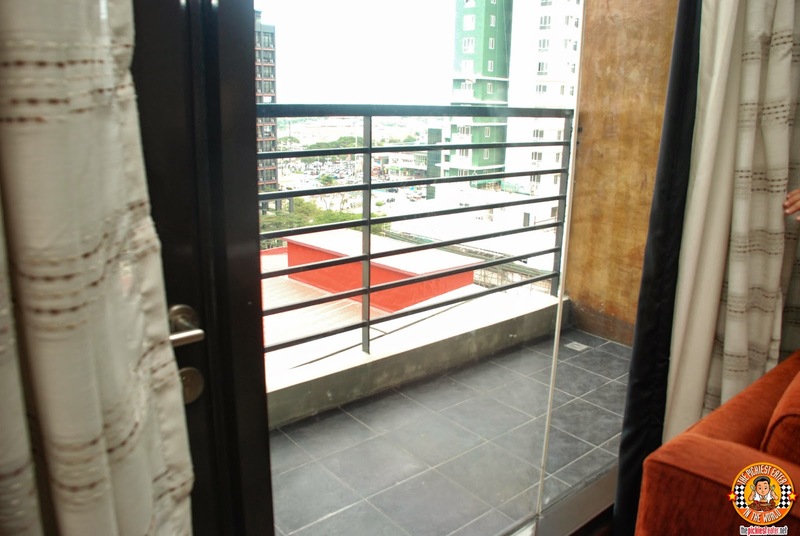 The Room Rate for the Penthouse Suite is P6,500 Net, which is very reasonable considering its size. 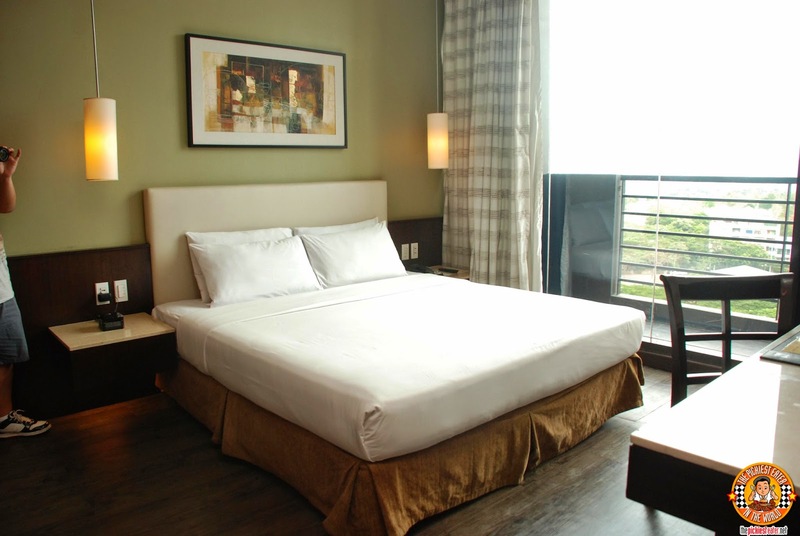 The Standard Room Rate is pegged at P4,000. 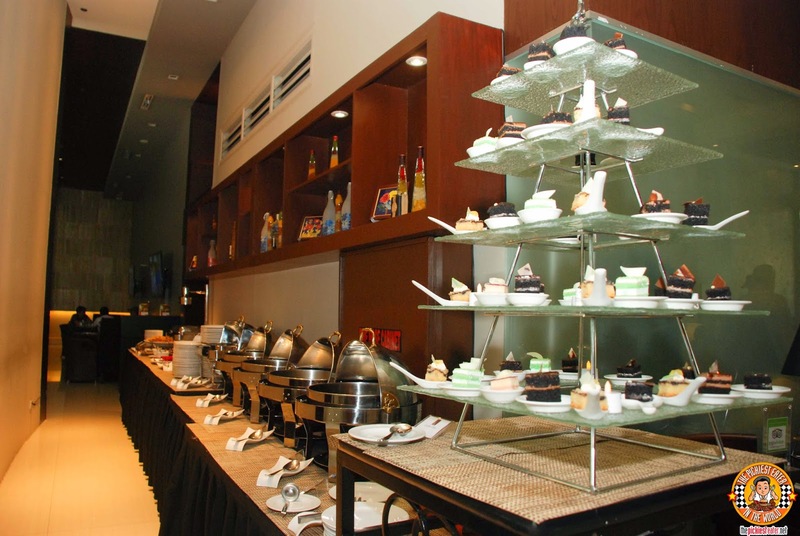 We were also given the opportunity to sample the buffet of Prime Cafe. Located near the lobby of the hotel, Prime Cafe was serving a lunch buffet, so we quickly got in on that. 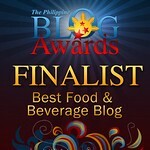 This is also the same area where guests avail of their complimentary breakfast buffet, and according to my blogger friend that stayed there www.foodreviewsmanila.com, at 6pm, it becomes Prime Bistro- a hot spot that provides their guests live entertainment to go with their food and drinks. B Hotel does not have a very large floor area, especially when compared to The Bellevue, but the available space is maximized to its fullest, and despite the limited area, I didn't feel cramped at all. 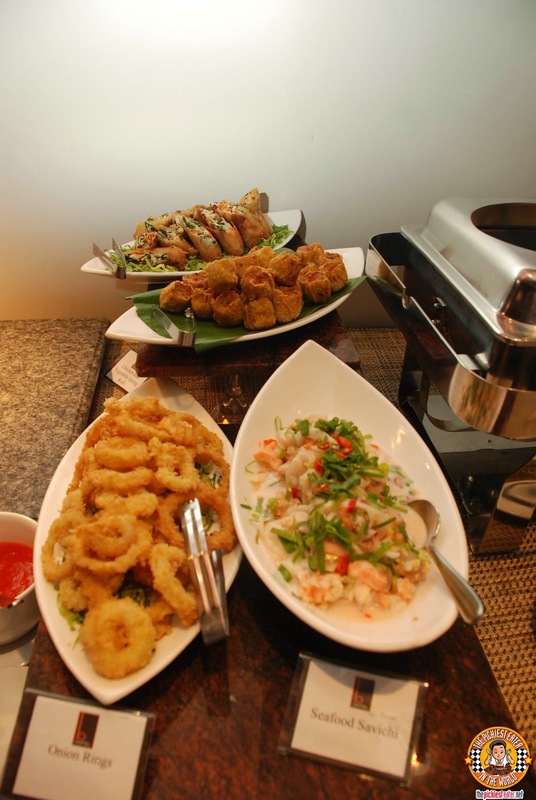 Among the appetizers available at the Buffet spread, was some crunchy onion rings, Deep fried Siomai, Chicken and Vegetable Spring Rolls, and to take a break from the oil, Seafood Ceviche. 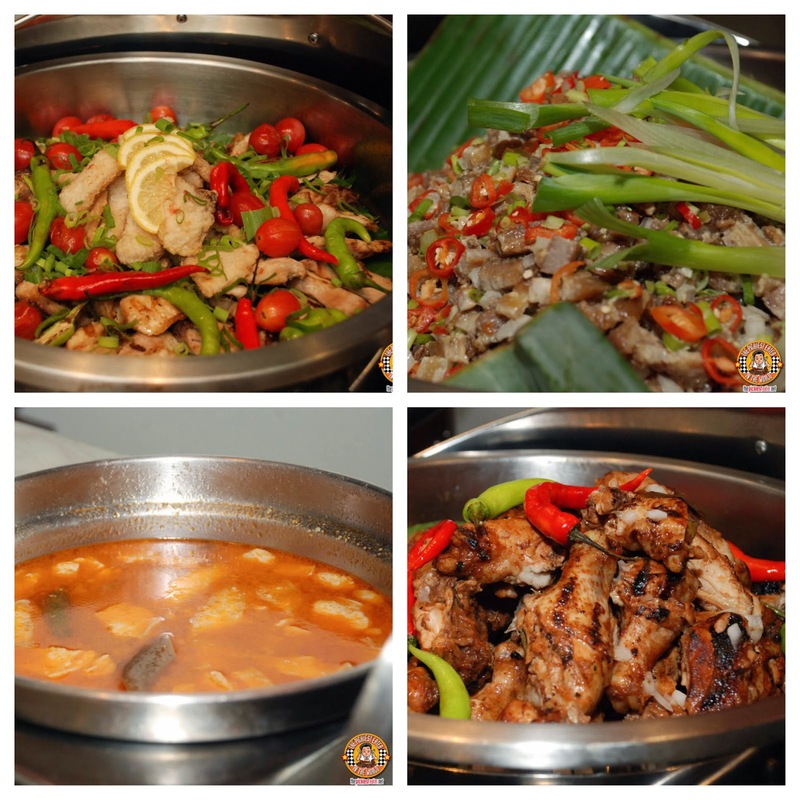 Some of the entrees that we enjoyed, was the (Clockwise from Top Left) Grilled Fish Fillet with Chef Sauce, Sisig (Although my friends noted it should have been heated a little bit more), The Prime Chicken Barbeque, and Rina really raved about about the Pork Belly Tamarind Soup. My favorite dish of the entire spread was the Crispy Pork Belly. 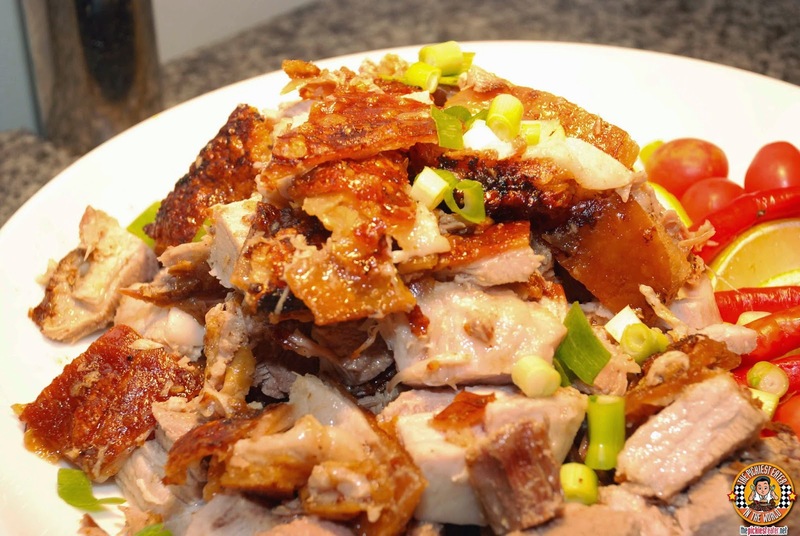 This was the closest thing you could get to lechon, without actually having to roast an entire pig. 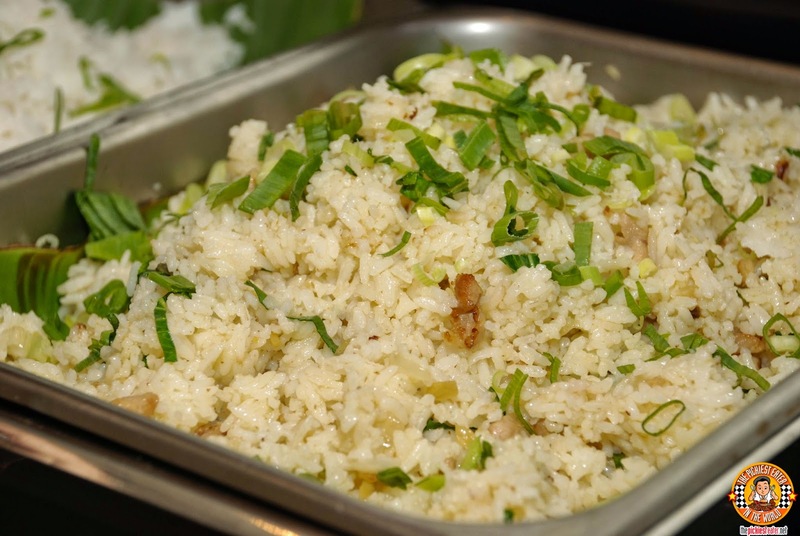 The fat melted in your mouth, while the skin maintained the crunchiness that makes such dishes irresistible. I accompanied my meal with their Chicken Rice.. Which was among the better ones I've ever tried - Especially since this wasn't a Singaporean restaurant. This could have been a meal in itself, and it paired wonderfully with the Crispy Pork Belly. 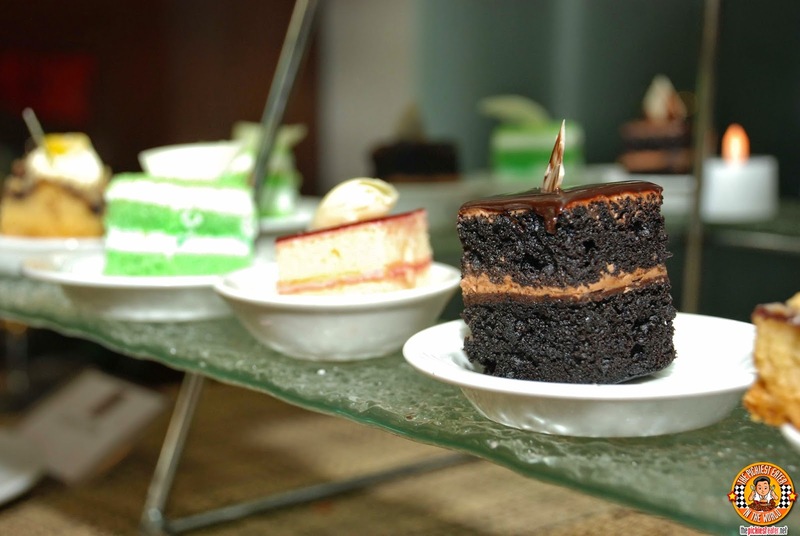 The dessert selection many not be mind-blowing, but you are given an extensive selection that will adequately serve as a nice finishing touch to your meal. 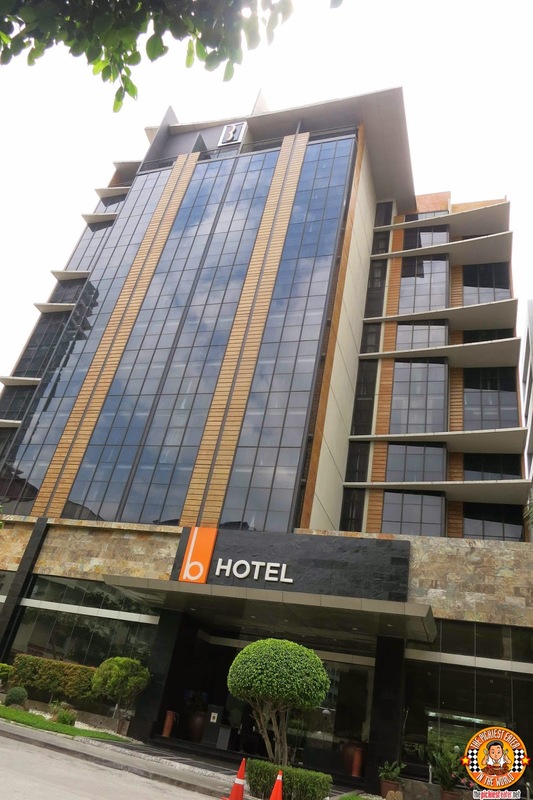 Though we were unable to take photos of it because it was in use at the time, B Hotel also houses a Function room, which can accomodate up to 100 guests. As a Business Hotel, B Hotel is completely capable of stepping out of the shadows of its "Big Brother" and can stand on its own merits. 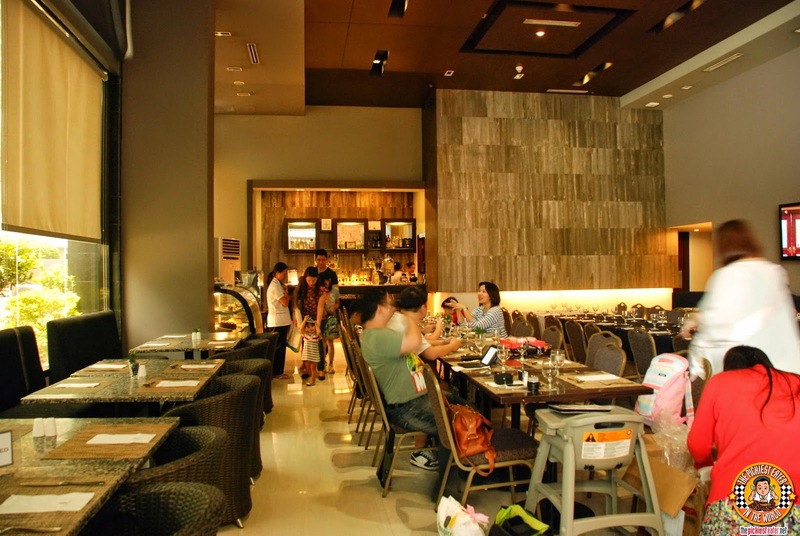 The location is accessible to other establishments in the South, and the service was impeccable. Definitely a hotel that should be in the list of a Jet-setting Businessman. 2107 Prime Street, Madrigal Business Park, Muntinlupa. haha sorry.. damn you auto correct!